If you’ve been following Spoonflower for a while, you’ve probably seen the name Becka Rahn pop up once or twice! 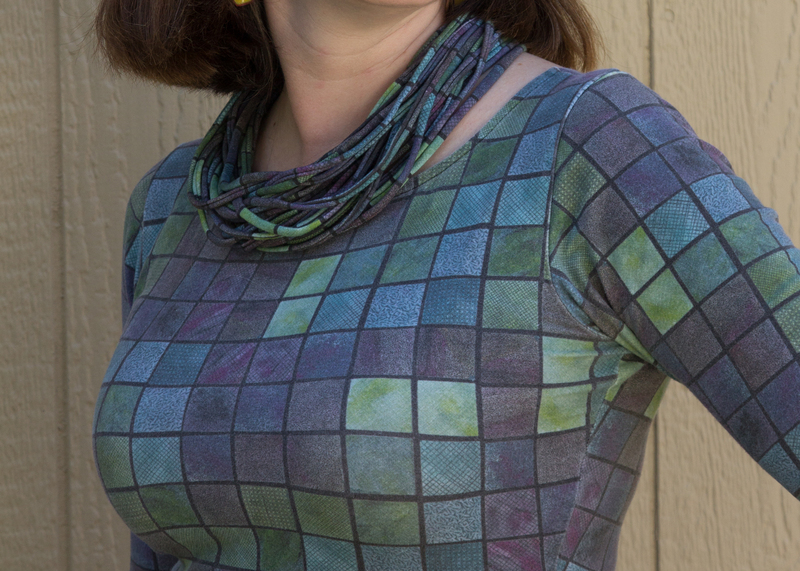 Becka is esteemed co-author of The Spoonflower Handbook, and most recently the instructor of our Spoonflower Masterclass series. 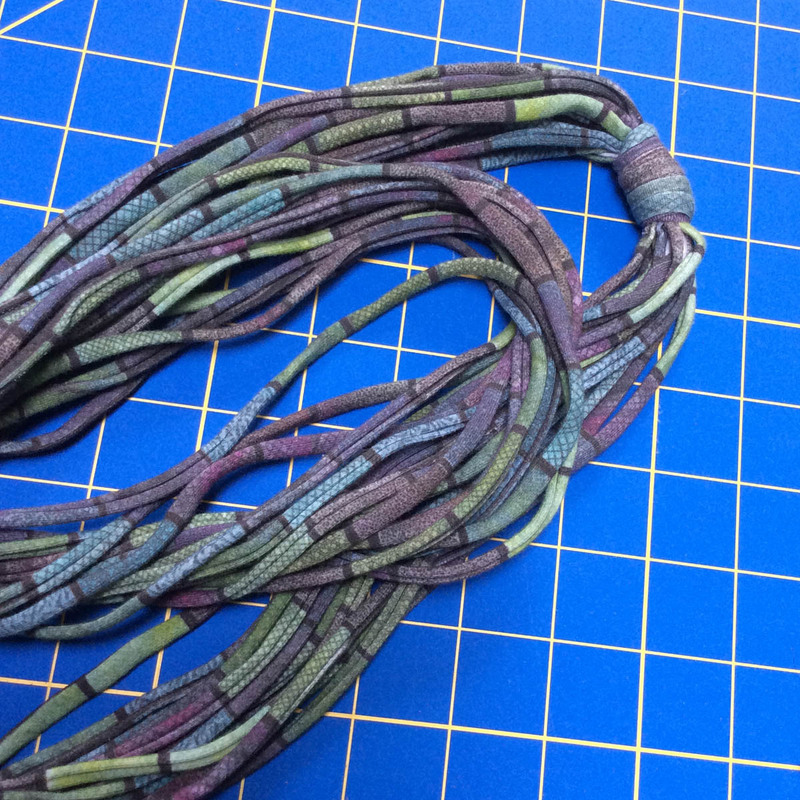 Becka is a talented fiber artist/designer in her own right and we are thrilled to have her show us how to use strips of scrap jersey to make a wrapped cord necklace in this simple tutorial. 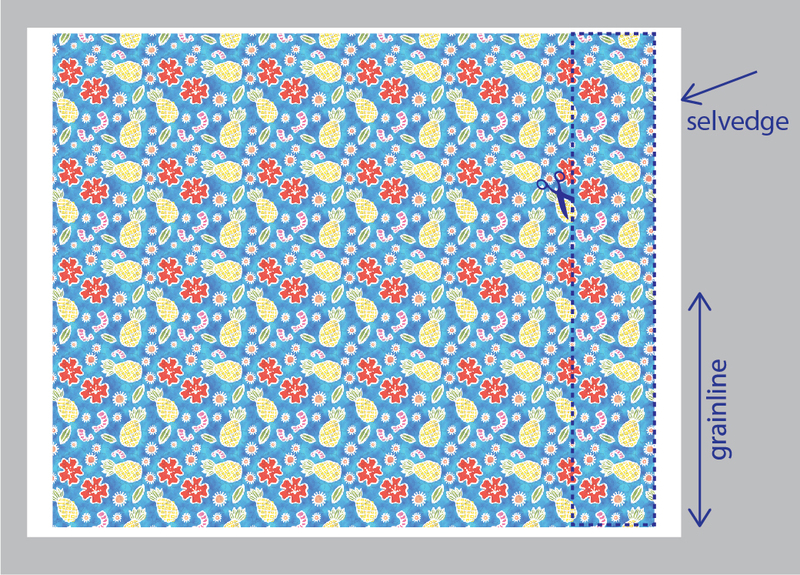 Or if you’re a visual learner, jump to the end to see how Spoonflower team member Meredith creates one in our new video tutorial. * Important note: This rectangle needs to be cut with the grain of the fabric. That means that you are cutting the 48” length parallel to the selvedge edge of the fabric. I was able to cut two necklaces from the scraps from making a Sprout Patterns Moneta dress. You can make several necklaces from 2 yards of cotton spandex jersey fabric. This project works great with either cotton spandex jersey or modern jersey fabrics. If you want to try another knit fabric, do a test first and make sure that it will roll up when you stretch a narrow strip. Cut a rectangle of knit fabric that is 8×48 inches. Make sure that the 48 inch side of the rectangle is parallel to the fabric grain or selvedge edge. Fold the fabric in half, matching the short ends and lay it on the cutting mat. Starting at the folded edge, cut a lengthwise strip that is 1/2 inch wide. Stop cutting when you are about 1 inch from the end of the strip. The strips will stay connected at this edge. You can use a piece of masking tape across the top edge to remind yourself to stop cutting. 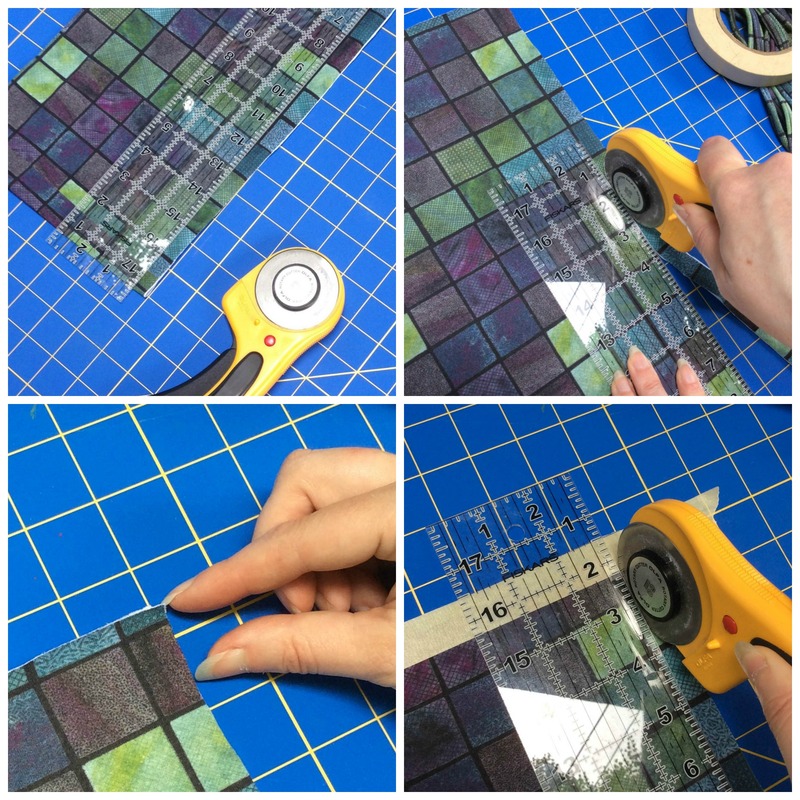 Continue to cut strips at 1/2 inch increments all the way across the width of the rectangle. When you get to the last 1/2 inch strip, cut that one all the way off and set it aside. We will use this strip later to make a knot. 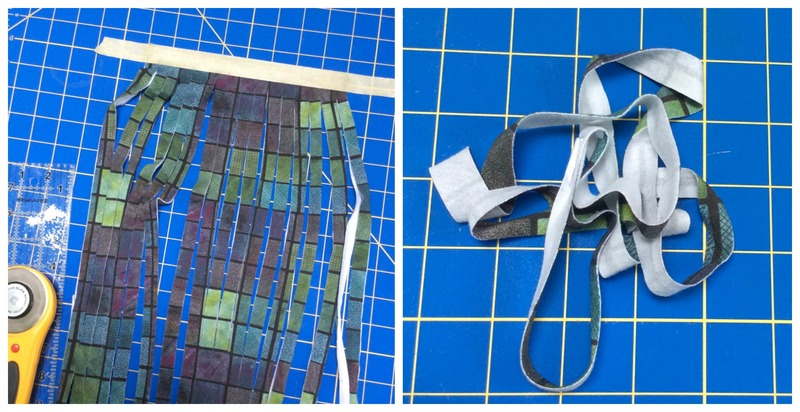 To connect the short ends of the rectangle, match them up cut edge to cut edge and stitch on the sewing machine using a wide zig zag stitch. Handle it gently so you don’t tangle up your strips or accidentally twist the rectangle before you stitch. You can also stitch it by hand with a running stitch and a narrow seam. Once you have connected these short ends, your necklace should be a loop. This stitching will be hidden later, so you don’t have to worry about matching the thread color.